On October 2-3, 2010, with the blessing of His Eminence Metropolitan Hilarion, First Hierarch of the Russian Orthodox Church Outside of Russia, and His Eminence Archbishop Justinian, Administrator of the Patriarchal Parishes in the USA, a youth symposium dedicated to the 90th anniversary of the Russian Church Abroad was held in New York. The Fund for Assistance to ROCOR was one of the sponsors of the event. 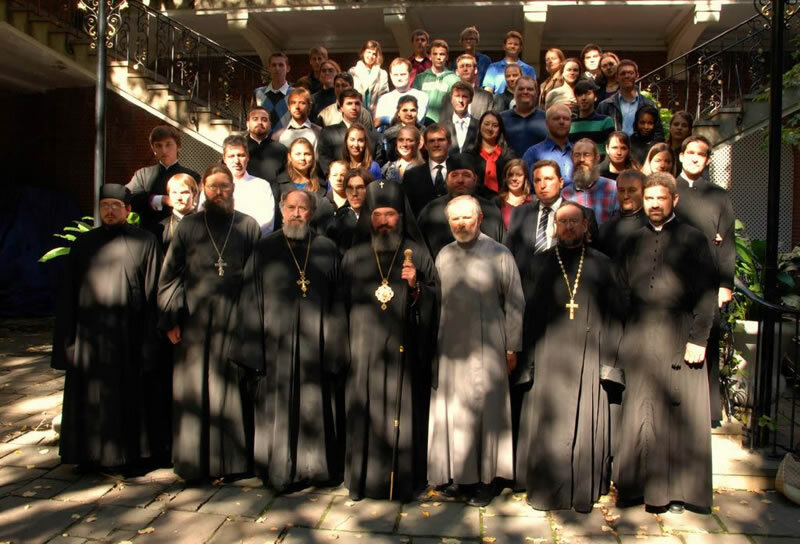 Before the symposium began, the participants and guests gathered at the Synodal Cathedral of Our Lady of the Sign, where Archbishop Justinian and His Grace Bishop Jerome of Manhattan, along with clergymen of the Russian Church Abroad and the Patriarchal Parishes, performed a moleben to the Holy New Martyrs and Confessors of Russia. The Vice President of the Synodal Youth Department, Protopriest Andrei Sommer, read a greeting sent by Metropolitan Hilarion. The Orthodox youth, who had come to the symposium from various states, had the opportunity to ask questions of Vladimir Safronikov, member of the Representation of the Russian Federation to the United Nations, who told them about the work of the Russian Mission and of real problems facing the world today which evoke conflicting interpretations. On the first day of the symposium, its participants had a lively discussion of how to preserve the best aspects of the Church Abroad and how to make use of it in their efforts today while adapting them to contemporary life. Igor Kochan said “We need such events, and I am happy that they are happening together with ROCOR, where so many years of experience in youth ministry have been accumulated. That is why our Patriarchal Cathedral’s youth group is glad to participate in this symposium and hope to work together in the future. Later that day the symposium members prayed at all-night vigil at St Nicholas Patriarchal Cathedral, where the Pochaev Icon of the Mother of God was brought from Holy Trinity Monastery in Jordanville This icon was brought out of Russia in 1920. After the service, the ROCOR and Patriarchal clergymen and youth, along with Vladyka Justinian and Vladyka Jerome, continued their discussions at a trapeza. The central event of the second day of the symposium was Divine Liturgy, at which Archbishop Justinian and Bishop Jerome officiated. After the service, the young people were treated to a trapeza prepared by the Synodal Cathedral Sisterhood. Summarizing the event, Fr Andrei noted the importance of making sense of the historic event which gave rise to the Russian Church Abroad far from the Homeland. The Youth Department’s Vice President noted that today, as 90 years ago, the main task of Orthodox youth must be missionary work in its various forms. “Over fifty people participated in the symposium. We are glad to see young people from Brooklyn participate in such an event for the first time. This youth is ‘new’ to the life of our Church, that is, those who came in the last ten years or so. The special mission of the Synodal Youth Department is to attract such youth to church, who, unfortunately, is slowly dispersing among American society. Some of them were born in and came to the US as little children. They have not developed a sense of preserving and defending their national identity in various forms (which is characteristic of the Church Abroad).